A used 6BTV came up on the local market. I knew the history of the antenna, and I had known the owner for decades, so I knew the antenna had not been abused. I also knew that the antenna was less than a year old. The price was right, so I purchased it. It arrived at my QTH with a cracked trap cover for 10 Meters, (I assume this happened in transport), and with lot of water dripping out of the 20 meter trap. I ordered replacement trap covers from New-Tronics, and proceeded to replace all the trap covers once the new ones arrived. Thankfully the previous owner had used Pentrox-A on all sliding parts, so the antenna came apart like butter. I also noticed that one of the hose clamps used to tighten the 10 meter element was stripped, so I got a new one of those as well. This pretty well took care of getting all the loose parts in one place in preparation for tuneup of the 6BTV. You can click any image on this page and get the original in large format. The factory configuration and spacing diagrams for tuning are for no radials. DX Engineering has a wonderful install guide for the 6BTV which puts the manufacturer’s instruction guide to shame. There are a lot of additional add ons DX Engineering sells for the antenna, all good. 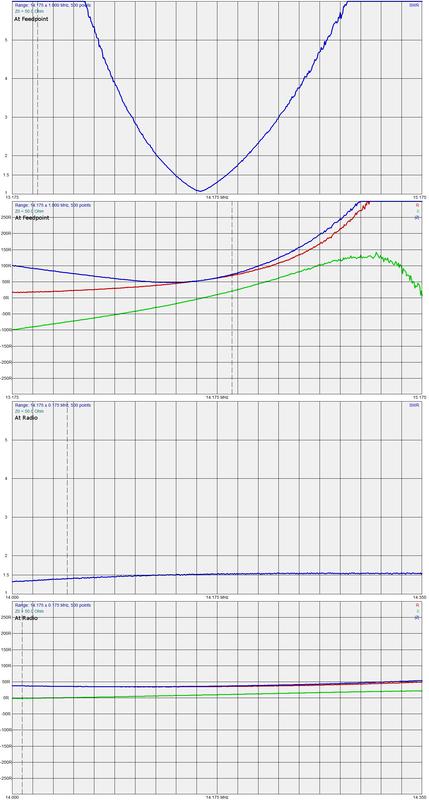 I would need a radial field to realize better performance out of the antenna. I was not happy with the manufacturer’s instructions to tune the antenna for the center of the band. I do mostly CW, or data, so that would not do. The first thing I discovered was that I wanted to do this by the book, and do it right, so I constructed a step by step process guide to do the install and tuneup. One of the first items was to decide where exactly to install the multiband antenna, and have it not affect other antenna, or be affected by other antenna. I have plans for a four square on 30 Meters one day, so I decided to draw out the final configuration for a two element 40 Meter phased array, and a four square on 30 Meters. I obtained a plat map from the county, and added the antenna and radial fields for all future antenna. This helped me select the right location for the 6BTV. It is the antenna just to the East of the tree in the backyard. I also installed underground cable feeds, and a remote coax switch on the rear of the work shed, and then ran a single feedline to the house and the shack. Next I constructed a step by step guide with all the steps I needed to take to get the 6BTV up and operational. Perform very rough tuneup on the antenna. Measure R value at base of the antenna. Add radials, and remeasure the R value. If R value makes no major change from the previous reading exit to step 8, else goto 6. Define the operating frequency for each band. 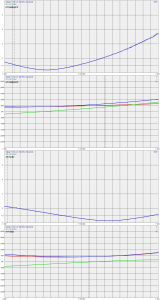 Measure actual two to one SWR bandwidth for each band. Select the center of the two to one spread, and decide where to put it, so that I could operate in the lower parts of the band, and cover the data parts as well. Tune the antenna to put the center point for a two to one SWR at the correct location on the band to give me no less than one point five to one SWR at the bottom of all bands but 80 Meters. Put 80 Meters resonance point at around 3.800 MHz, so I can use the antenna on the phone portion of the 80 Meter band. The very first thing I did was to call in a locate for all pipes, and cables that might be under my yard. This step absolves you of all liability if you hit something that you should not hit while digging. I NEVER dig without a locate. I next located where each hole needed to be, and then I marked each location with a red circle. Also given that I had a large number of post holes to dig, I elected to use a powered post hole digger, which I rented from one of the local rental shops. The thought of digging each each post hole with a hand held post hole digger was not appealing to me at all, and I am not sorry for the money it cost to rent the digger. I next purchased a set of six pole levelers. They are cheap, only a few bucks, and once you have the posts in the concrete, you want to quickly be able to see if the posts are vertical. If not, you can tap them into place, prior to the concrete setting. I also wanted a ground rod at each antenna site, so I again headed to the local rental store. I rented a ground rod driver. This is an impact driver and it takes about 10 minutes to drive in an eight foot ground rod into gravel and clay. I have driven in ground rods before here, and that takes about an hour, six of these would take far longer as I would tire out. I just rented the driver, and spent about an hour and drove them all in. After allowing the concrete to cure for about a week, I installed the DX Engineering Radial Plate, and the DX Engineering Tilt plate for the antenna. Next I bolted the antenna to the tilt plate, and connected the existing five radials from the old Challenger install to the radial plate. I used eye rings, to do this, crimping each ring carefully as they would be out in the weather for years to come. The Challenger had no need of a radial field, save the three radials used as a counterpoise for 40 Meters. So I repurposed the three radials, and added 5 more. That gave me 8 radials, as 40 Meters was the lowest frequency band I had any real interest in, I made them all 1/4 wave long on 40. The goal is to add as many radials as needed to see a very small change in R while I double the radial count. When I see little change, or if I approach 36 ohms, I will stop, as the next doubling will do even less than the previous doubling did to reduce R.
Next I did a very rough check of the tuning of the antenna, making sure it was in the ham bands, I walked in each band using the AA-54 to check SWR, and as I got to each band, I just got the dip into the band, not at a particular location within the band. That would come later. 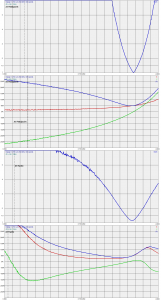 As the radial field changes, the antenna tuning changes, so there is an interaction between the two. 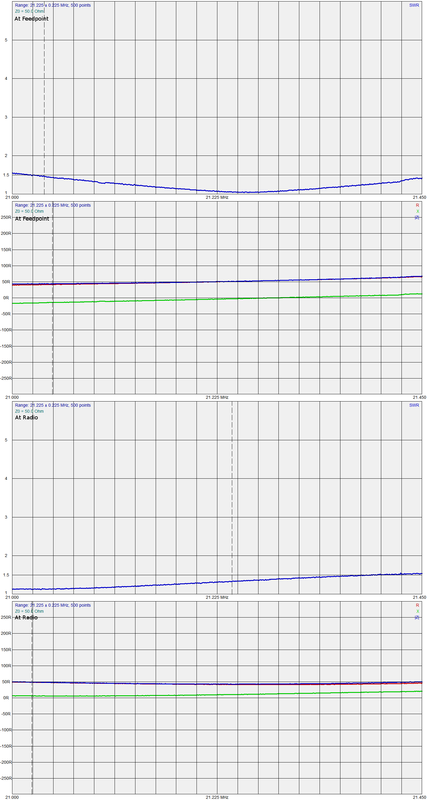 I did not want to spend a few hours getting the antenna tuned to the exact spot in a band, only to have that tuning change as I added radials, or chokes. Next I dropped into loop mode, measuring the R value then I adding radials, and measuring R again. I ended up with 13 radials, and will probably make it 16 radials just because 16 is a power of 2, and numbers that are not bother me… I started with 4 radials, measured R, then added 4 more, that dropped R, I added 8, and R dropped again, although not very much. I added another 5 radials, (ran out of material), and measured R again, and saw almost no change… So I concluded doubling again would not win me much lower R values, and called it done! I am a bit surprised at how fw radials it took to get to this point, and I will be adding more as time goes on anyway, because I believe I will get a bit more performance, but not much beyond 32. 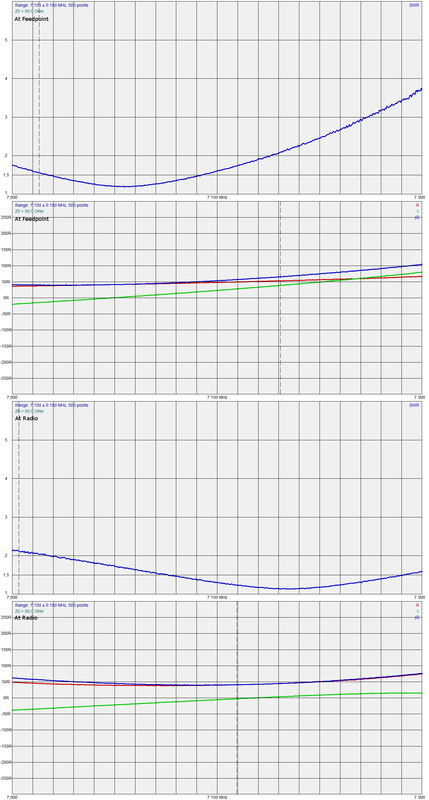 Now that the radial field was mostly complete, I could actually begin the carefully tuning the antenna. I first decided in each band where I wanted the low point to be for SWR. I operate CW more than any other mode, so I wanted to skew all SWR readings to the low end of each band, save 80 Meters– I only do SSB on 80, so I wanted that to be on the high side of 80. To do this I needed to decide what the bandwidth of the antenna was across my arbitrarily selected worst case SWR conditions for each band. This would give me between 2.00, to 1.7 to 1 SWR at the bottom of each band. The upper end was left to fall wherever it ended up, in most cases the top end fell past the high end of each ham band. 80 Meters is the only exception, and is treated as a special case. You will find below the final values for all ham bands, and in most cases the starting point. Once we hit 15 Meters, the bandwidth is so wide as to cover the entire band, plus a wide margin, so that data is not included. If you are interested in that data, please feel free to email me, I will send you the raw data files. Below you will see six images, one for each band, 80, 40, 30, 20, 15, and 10 Meters. 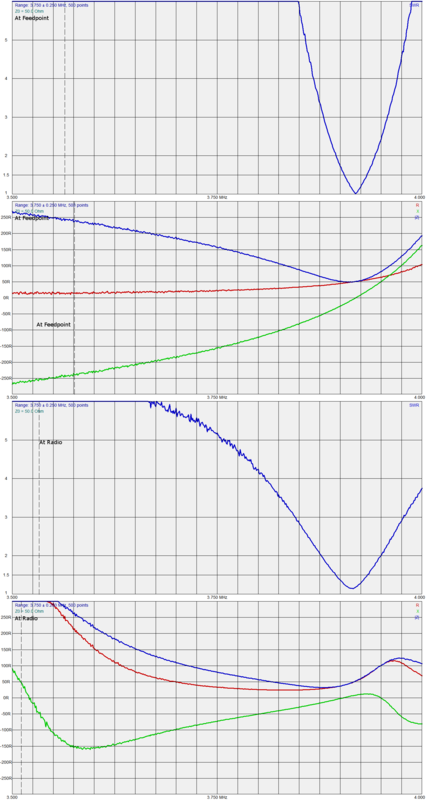 Each image consists of four graphs, from top to bottom the graphs represent the following, SWR as viewed at the feedpoint, R, X, and Z, as viewed from the feedpoint, SWR as viewed from the shack, and R, X, and Z as viewed at the shack. You can click a graph to get an expanded view, click the expanded view and you will get an even larger view. 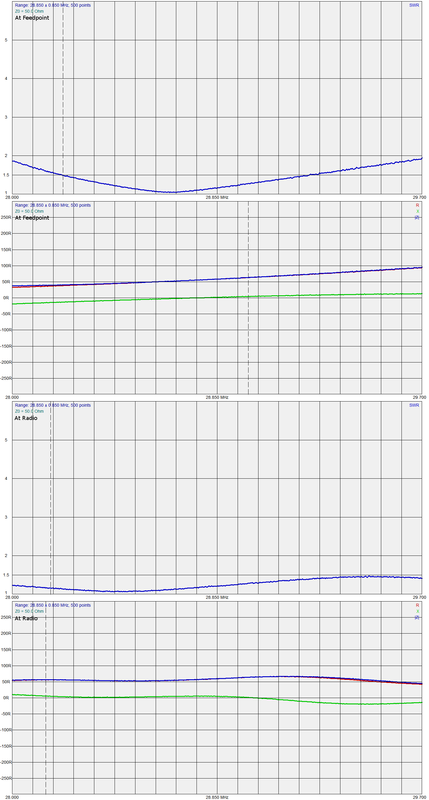 I took a set of scans of the SWR of the antenna using 8 radials, and then again using 20 radials. The result was that for the most part as radials are added the resonant freqiency shifts upwards slightly. The recieved signal levels however increased dramaticly… On average most signals were around S4 to S5 in the FT8 sub-band. As redials were added, I noted an increase in overall levels of around 3 to 3 S units on the K3. The S readings were taken over a few days time, then averaged out to get to that number. 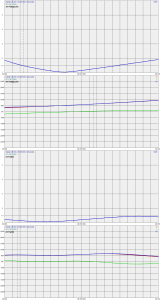 Here are the SWR grapsh of the same antenna, in the same place, with the same ground conditions, (no rain), as the radial count went from 8 to 20 radials. 80 Meters with 8 radials, 60 KHz bandwidth. 80 Meters with 20 radials, 63 KHz bandwidth, and lower SWR. One must remember in this scenario, that a 1:1 SWR on a vertical guarantees it is not set up correctly. 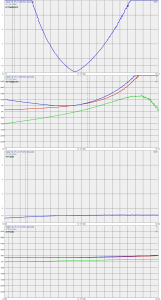 A perfect vertical, in a perfect environment will have around 36 ohms, and show a 1.4:1 SWR. Rather than try and explain why, see this very extensive article on the subject. Click on any image above to expand. You may have adjusted the trap too far… I had something like that happen when I adjusted the 30 meter trap beyond where it was designed to be. Antenna input impedance is not an indication of efficiency. There use to be a chart in the ARRL antenna book that showed efficiency vs number of radials. ARRL recommends 16 radials for decent efficiency although broadcasters use 120 for 95% theoretical efficiency. For 30 radials length can be 0.15 wavelength. What IS THE SWR on each band? An excellent article Dave, I’ve been running a Butternut Vertical for about the past thirty years or so. Mine started out as a two band unit and I converted it to 6 band use. It has been an outstanding performer for me. I recently moved it to a different location here at the QTH and installed a new radial field in the process. 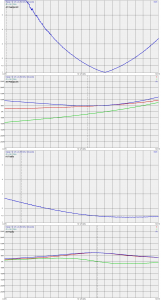 I used an AEA 121 for setting each band. I wish I had read your article before redoing everything. I ended up much as you did but with considerably more effort. Thanks for posting all this good information. Gene, you could put an ad in your local Craigslist that you need help setting your vertical up. But I do believe if you follow the directions and are not in a hurry you should be able to figure it out. Just try tuning it for the lowest band first and see what your analyzer shows. Then try transmitting a low power signal through an SWR meter and take data points along the lowest band, which I believe is 80 meters on your antenna. If your lowest SWR is out of the band you need to make further adjustments. Adjustments on different bands will affect other bands, so you follow the tuning process per the directions to minimize this. 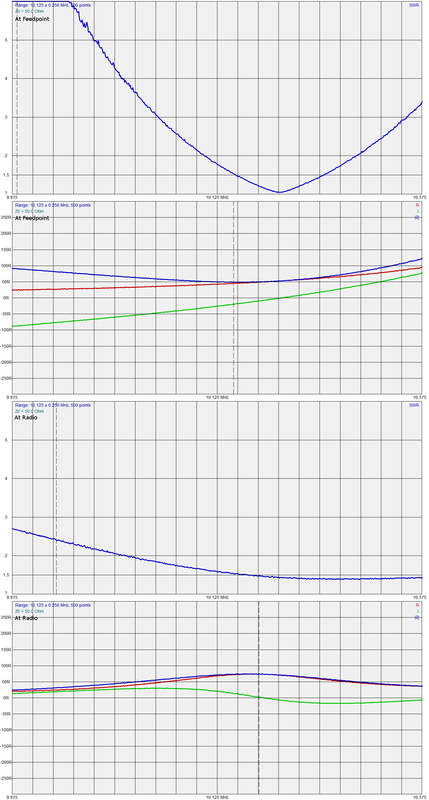 Adjustments on a band should move the bottom of the SWR curve up or down. You move it to where you plan to work in those bands, continue with the adjustments, and keep doing that until you have every band’s low SWR where you want. 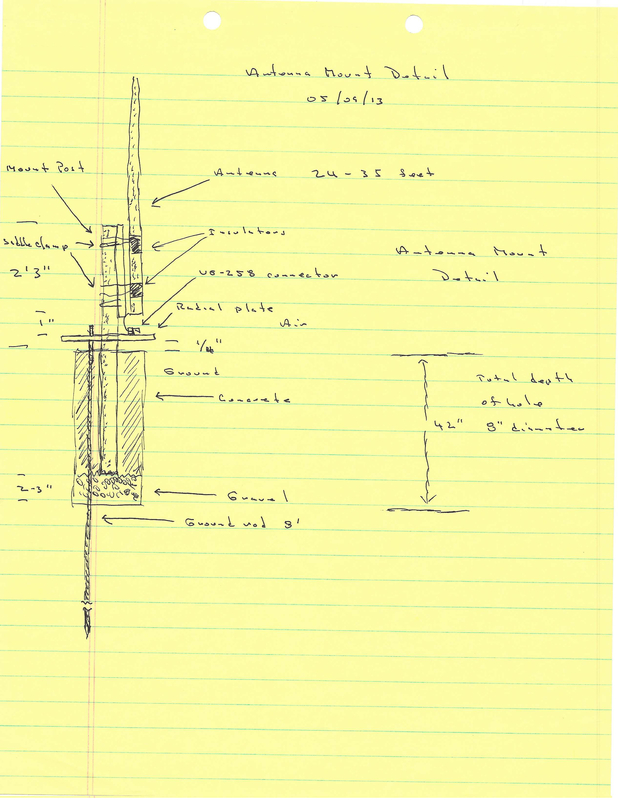 A trap dipole or vertical is a compromise antenna that is shorter than a full length antenna. It is possible that your MFJ antenna analyzer is not working correctly. I’ve read that the model you have is not easy to work with. If you have money to spend the MFJ-223 may be much easier to work with since it has a graphical display, which shows at a glance many data points on a graph-like scale on the LCD readout. I picked up a uses AEA HF Analyst SWR-121 for $30 at the Hamvention (biggest hamfest in the world!) in May of this year and it made quick work of tuning my mobile antenna whip antennas.I could see quickly where the SWR dip was and knew to make it shorter to go up in frequency and longer to go down. A 102 foot doublet, fed in the middle with open wire line (or window line, which is similar), should tune on any band above 3.5 MHz through 30 MHz and possibly 6 meters (50-54 MHz) also. Other lengths work well also but this is actually the length of an MFJ antenna that comes with everything you need if you don’t want to build it yourself. A fan dipole is simply multiple dipoles fed at the same point. They’re more complicated than a doublet but you tune each band separately and there is very little interaction. I think 5 or 6 bands is a practical limit but one cut for 40M will work on 15M, so you get a band “for free” on the 40M dipole. 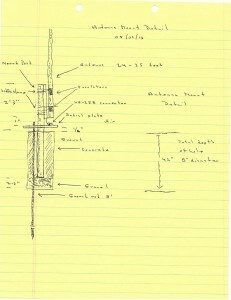 Thanks very much for all of this great information on cleaning up a 6BTV antenna. I have had one on my pier over the Chesapeake Bay and it recently took a pretty nasty storm. Time to tear it down and clean it up. I was not sure where to start until I read your article. Appreciate all the great reference Links too. I will summarize my results on my Ham Blog (www.kg3v.com) and will Link to your article. Sorry about the fat finger/spell check typos. W4DBL. Well done. I have a 6BTV and have never been able to get a good SWR on most bands. Like you, I got the tilt base and a few other DXE pieces. My real issue is the old adage: “Location, Location, Location “. The plan was to operate this as a no radial Verticle. No plan survives call ntact with the enemy and this one is no exception. The area there I had to locate the mount is in a strip on lane along the back of the lot. About 8×30’. To the rear is a ~45 degree slope to a drainage ditch. This area is not accessible for radials. The other three sides innclude a wall, solid paved area and the end of the lot. My initial install was a post driven in about out 4 feet with 18 inches above ground. This gave me the scattered SWRs. My measurements were done with an AA-600. My conclusion after many sweaty hours, was the low conductivity of the FL sand made this one almost unusable without a basic radial field. When you add the tuning issues to the HOA was issues, I pulled the antenna back into the garage and went to plan B. Plan B is a Ciro Mazzoni Baby Loop with a Yaesu rotator. I’m working on an aluminum mount so I can easily pull the antenna during hurricane season as needed. This one has a 100 mph limit. But the real issue here is blowing and falling tree limbs. Easier to pull it as needed. If Plan B doesn’twork, then I’ll go back and tinker with the 6 BTV. If it does, I’ll still see if I can get it to work as a pure vertical. Will post once I make some progress. Since someone will ask about long wires and dipoles, the HOA and look t size pretty much eliminates those options. W5GNE, Magnolia, TX., I loved your detailed planning method and the way you presented your info. I am new to Ham (Tech Feb.,2018, General August, 2018). 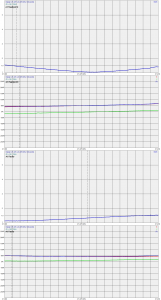 I setup a di-pole with an auto tuner with no problems. I picked up a 4-BTV and up graded to a 6-BTV 1/4 vertical a couple months ago. But, being new I have had a difficult time attempting to tune it. I have purchased all the DX upgrades (radial plate, quick tilt, Choke, 80 radials 32 ft each) and set it up. Its pretty but not tuned. Yea, I have all the DX Eng. manuals and have attempted to follow them. I have used a MFJ HF/VHF SWR Analyzer Model MFJ-259CM (new) but I think its an “operator error” issue. I sure wished you lived near me to help out. Most of the Ham guys in my NARS club have di-poles and do not understand a vertical.